Baby Rhino Oz at Baby Rhino Rescue | Adopt and Donate Now! Oz came into the sanctuary after his mother was violently poached in front of him in the Kruger National Park. He arrived at the sanctuary in good condition, not dehydrated as is usually the case with traumatized baby rhinos. He took to the milk bottle easily and began to adapt to his new life at the sanctuary. Oz was introduced to Warren and Don and the three baby rhinos became very close friends. Even in mid summer mid day heat, Oz wanted to lie very close to his new friends. When Oz and his friends went down to the big rhino enclosure, life just got more fun: he was taken out in the morning to the bush, where he could eat lovely green grass, and rest under the mango trees. Baby rhino LoFo entered the scene and Oz gained a new friend. And then — Twinkle arrived! 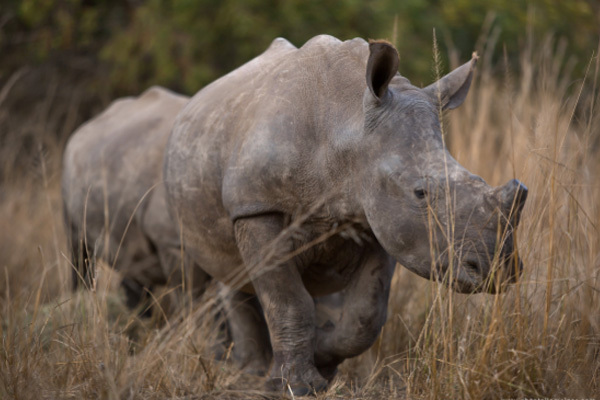 She is a beautiful, young female rhino and was introduced to all the boys. At first, Oz was weary of the female joining his band of brothers but soon grew to love her as one of the boys!